We found a few self-seeded plants in the garden recently, that needed to be moved and we also had a few succulents in small pots that we are planning to plant out in the garden next summer. On our recent trip to the south of the country we picked up some lovely wild tulip bulbs. We planted most of them outside but a few were left and we thought they would be nice to incorporate into an indoor arrangement to add some lovely soft spring colour. We decided to combine all of the different elements above and create a natural looking mixed planting with a few quirky additions. This project is suitable for a conservatory or a cool bright room. We started by lining an old woven basket with some plastic bags and added lots of well rotted manure mixed with potting compost. We placed the bulbs at about 15 cm depth and placed our other plants around them. We added more compost and manure to secure all the plants into position and added lots of moss on the surface for a whimsical, fairy-tale look. As a final addition we added a few of the crafted mushrooms that we made a couple of years back, along with two ceramic deer, probably from the nineteen-fifty’s? You can see how to make the mushrooms in this previous post. These decorations will do nicely for a while and closer to midwinter we might exchange them for some sparkly decorations and a string of fairy lights. Come spring we might add an old birds-nest and a few paper eggs just in time for the tulips to blossom. In late spring all of our plants should be well rooted and happy to be put into their final positions out in the garden. We think this is a great way of having some fun while using only things that are to hand and nothing that will be thrown away or discarded afterwards. For us it is a much better option than buying expensive, ready made arrangements that you can find in almost any shop at this time of year. The plants in them are often grown in heated greenhouses and made to flower at the opportune moment. Although you can save your poinsettia or your hyacinths after the winter holidays, we fear that a lot of them end up in landfill and that is a rather sad prospect. ← A touch of frost. That really is an odd mix. It seems that succulents are typically with their own kind, not with ferny or grassy plants or wild tulips. They will all be planted out later in the spring in their final place. 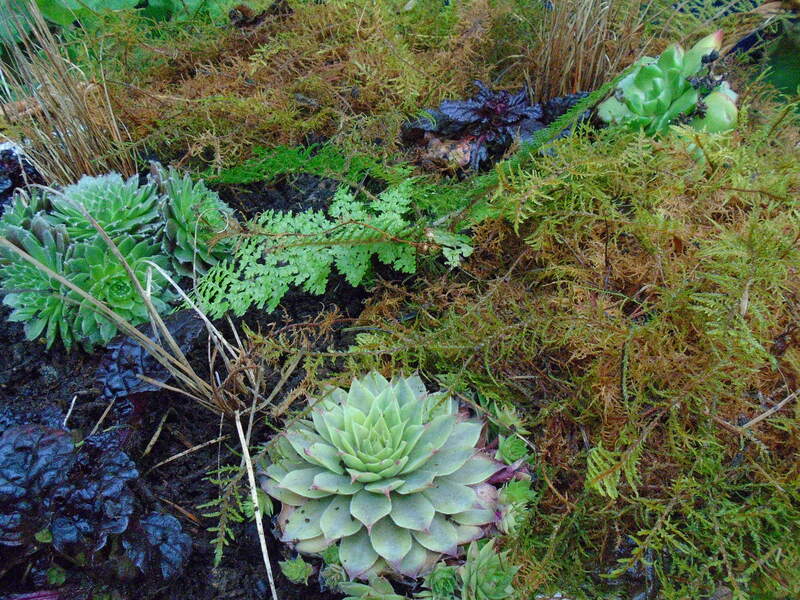 It is just very popular in Scandinavia to use succulents in this type of winter time arrangement mixed with moss. That’s where I got the inspiration from I guess. Yuccas are oddly popular in Scandinavia too. It is funny that I happen to crave the spruce and fir that live in cold climates, but Scandinavians crave desert plants, and some have done more for classification of the specie than American botanists!